As an online retailer, optimising your fulfilment strategy can mean the difference between creating a sustainable brand or risking complete failure. Be sure to have considered these points before inking a deal with a provider. as multiple industries are being revolutionised by technology. of all sizes – but it doesn't have to be an ongoing headache. With the explosion in online purchasing over the past couple of years, most courier and transport organisations have tried in some way to get a piece of the action; some got in early and have a significant share of the market putting processes in place to cater for it, and others are still working on it. Even those companies who have always maintained that they don't want to handle home deliveries have had to re-consider due to such a large demand and potentially a very lucrative market. There still doesn't seem to be a single solution out there for the online retailers due the variety of the products being sold, and the changing expectations of the online retailer and buyer. The nature of the eBay category sales make them the most difficult for courier companies to handle. This is because each delivery can be vastly different to the next; the collection location can be anywhere, and quality of the delivery details and packaging can vary, making it very difficult for the courier company to effect the delivery. The enterprises that are selling a specific range of goods collected from a single location (warehouse/shop) are a lot easier to cater for as the products and expectations are defined by specific collection times which are scheduled and can be managed. On the other side of this are the enterprises offering a variety of options to the customer, which can include '30-day trials', 'exchange if you're not happy with the goods' or even 'refunds'. These return deliveries are far more difficult to manage for the online retailer and courier companies. There are many delivery options available in the market today and while Australia Post is still the most commonly used, their competitors are growing in number and size. There are several things that need to be considered when selecting your delivery provider. After all, while the goods may have been sold, the transaction is not complete until the customer has received their goods. If the customer is not happy with the speed, service, handling etc. of the order, this could significantly affect future sales. First you need to look at your business and the products you are selling. How are they packaged? – Some packaging may look very nice, but is just not suitable for transport. What delivery time do your customers expect or prefer? Do you need confirmation of the delivery (proof of delivery or 'POD')? What is the average value of the goods?How many deliveries are you despatching? Most courier companies are going to ask you these questions, but let's look at the reasons why these questions are so important. Based on the size of the goods being delivered, you may not be able to use the Postal system; if they are very large for example. You could be paying your delivery charges based on the volumetric weight (cubic) rather than the dead weight. Some companies are simply not equipped to move these larger items. Are they small enough to fit into satchels? This can mean a significant saving in cost as opposed to small cartons/boxes. Satchels can be delivered to most locations around Australia for a fixed rate, where carton deliveries can vary significantly depending on the delivery destination (and can be up to 10 times more costly). If the goods are fragile then some transport businesses will simply not handle them. Do you want them to go down a sorting conveyer system or be sorted by hand? Do they need to be a direct delivery from despatch to the customer? These are questions an online retailer will need to consider. How are the goods packaged? If you have fragile items but the packaging is as such that the potential damage is limited, then there is far less concern. If your goods are not in cartons or satchels then some companies will simply not want to deliver them as they won't be able to move through their automated sorting systems. Is the packaging evenly shaped (i.e. the packaging may be rectangular as opposed to an irregular shape, which can make loading and handling very difficult)? Are your customers potentially Australia wide and in any location? Or are they defined to a particular area? There may be some transport businesses, particularly smaller ones, who specialise in a geographic area that offer a great price and service, but are limited to their geographical abilities. The delivery time expectation is very important. Do you offer a choice? Have you promised 2 days? There is no point sending a delivery on a road freight service from Sydney to Perth when the customer expects a 2-day delivery. It simply isn't going to make it on time. 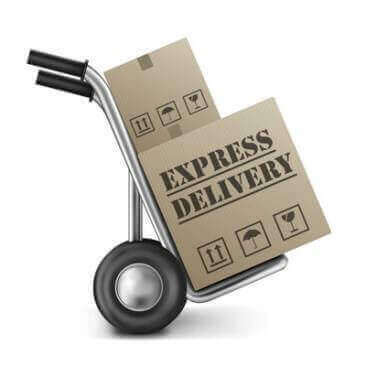 Do you want to offer your customers a same day delivery or even a three to four hour delivery? Can you pick, pack and despatch the goods soon enough to meet this requirement? From where are the goods being collected? Depending on your location, even if in a metropolitan area, this may or may not be possible. Do you need or want to confirm the goods have actually been delivered? Most courier companies have some sort of tracking system, but not all, and they can vary greatly from an immediate email or SMS Proof of Delivery (POD) using sign-on-glass technology, to having to scramble through paper manifests or driver run sheets to obtain that same POD. Based on the average value of the goods you sell, some delivery options may simply be cost prohibitive. If you are selling goods with an average value of $25, paying $20 to deliver them would simply not be economical unless the customer is willing to pay for it. If your goods are worth $1000, then $20 for delivery (for a fast safe delivery) could be very realistic. How many sales are you making? This is probably going to make the biggest difference to the cost of transport. The more you deliver, the better position you are in to negotiate -and every transport/courier company is negotiable. Stability of the Business - Have they been trading for some time and have a good reputation in the market? There have been a number a large transport businesses and numerous smaller courier business that have folded in the past 18 months. Some customers have had goods in transit that they have been unable to retrieve for some time, greatly affecting their reputation with the end consumer. Service range – Do they offer a range of services? Coverage – Can they deliver to all of your potential customers? Current Customer Base – Do they currently handle similar goods or could there be a conflict of interest with any of their current customers? Tracking – How good is their tracking and POD system? Customer Service – What level of customer service do they offer? Consigning System – How do you book your deliveries? Do you need to fill in consignment notes? Is everything online? Can you have a data link for automatic consigning and booking? Re-delivery – Do they have a re-delivery option when the customer is not home? Speed – How fast is their service? Account Management – Do you have an Account Manager you can work with to ensure you are getting most of the service available for the most economical rates? And are improvements in the delivery process constantly reviewed and put in place? Ultimately, a sustainable relationship between an online retail business and its fulfilment provider will hinge upon thorough research and crystal clear communications. Be sure to understand the workings of your own business needs before seeking to learn about the functionality a courier or other fulfilment company can provide, as any disconnect between these concerns will result in lost revenue. As an online business, your number one priority has to be ensuring the fast and efficient delivery of goods to the customers' doors. Without this, those same customers would have no reason to purchase from you above any other offline competitor. In next week's instalment on this series, Garry Yovich discusses other concerns for online retailers to consider when partnering with a fulfilment company, as well as providing some insight into general trends in the local online industry.